Chris Boardman has Tweeted his mother Carol Boardman has lost her life this morning, following a collision on her bicycle in North Wales. My thoughts are with all those left behind. I had the pleasure of meeting Carol many times when I lived on the Wirral. 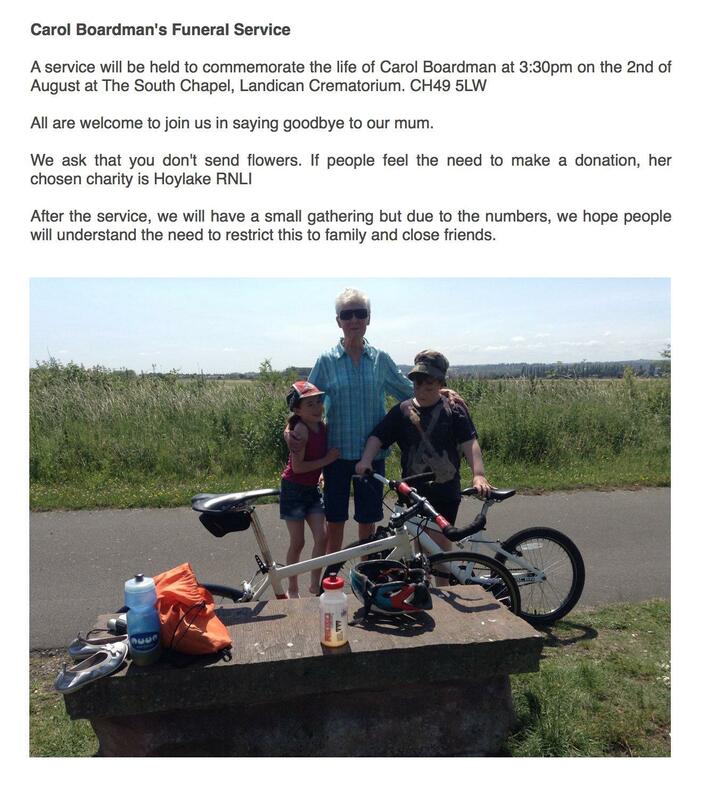 She was a warm and welcoming person, who was passionate about grass roots cycling. A tremendously sad day, my thoughts are with Keith, Lisa and Chris and their families. Horrible news. Thoughts with all her family and friends. After all the good work and words Chris has spoken championing cycling as not just a sport but a mode of transport, this tragedy just seems even more injust. Thoughts are with Chris and the family. Ride in peace Carol. RIP Carol. Terrible to hear this. Life is so cruel. Awful news. R.I.P. Carol Boardman. My thoughts to all your friends and family. So terrible on so many levels. Very sad news, thoughts with the family! I initially said I wouldn't black logo as it wasn't within M25 or a member of LFGSS. However several people have PM'd, so out of respect I have just changed the logo. Mrs Wrongcog and I are a day behind in our TDF viewing and so only now saw Channel 4 announcing this (in a very classy way I thought). This is very sad, very unjust and thanks to V for changing the logo - most appropriate I feel. So strange to hear, Chris Boardman done so much for cycling and now this. Funeral details. Expect a large ride out to the venue with bnecc. The driver and his partner will be standing trial at crown court. The evidence tampering will probably attract a heavier sentence than the fatality. Well, it's that, plus the implication that one or both of them may have been on their mobiles at the time. 30 weeks in jail for 'careless' driving. And an 18 month driving ban, which just seems so pathetic. As Chris Boardman says in the linked article, driving is a privilege not a right and people who kill others should have that privilege removed. I find it so frustrating that this goes down as "Careless Driving" rather than Dangerous. Using your phone while driving is universally known to be dangerous. There is a specific and well publicised law prohibiting exactly that. It can only be done cognitively. You can't accidentally use your phone while driving. It is not careless to do so, it is dangerous. I know the argument is that it would be difficult to secure a conviction for dangerous driving because of the jury system, but this just seems so flawed to me. How can this be addressed? Could a solution be to get rid of death by careless driving as a crime, and only have death by dangerous driving, giving the judge sentencing guidelines that account for the range of circumstances that can cover (which would include everything currently covered by careless driving, and in the process increase jail sentences for cases like this? I dunno, I have zero expertise in this area, it just seems like its not working.